The Sitar Diaries- The Good Stuff – Random. Structured. Haphazard. All Me. The previous blogs have boiled down to this one- what to play on a sitar. Rather what is usually played. If it so pleases people I suppose they could play Pink Floyd as well but the compositions which have been around for centuries are usually based on something called Swar (the notes Sa Re Ga et al). The Swars combine to make Thaats which in turn become bases for the ragas or the more detailed, elaborate music compositions. Sa– Shadaj, Re– Rishabh, Ga– Gandhar, Ma– Madhyam, Pa– Pancham, Dh-Dhaivad, Ni– Nishaad. The thaats use sharps and flats to arrange a pattern of notes on which the ragas are formed. Each thaat is named after the most popular raga generated in it. Some of the raags that I really are Maalkauns, Bhimpalaasi, Hansadhwani and Jaunpuri. The Hindustani raags are often identified by being aptly played during a particular time of day or time when it has the maximum effect due to its tonal quality and supposed when it causes the optimum amount of enjoyment to those listening and those playing it as well. 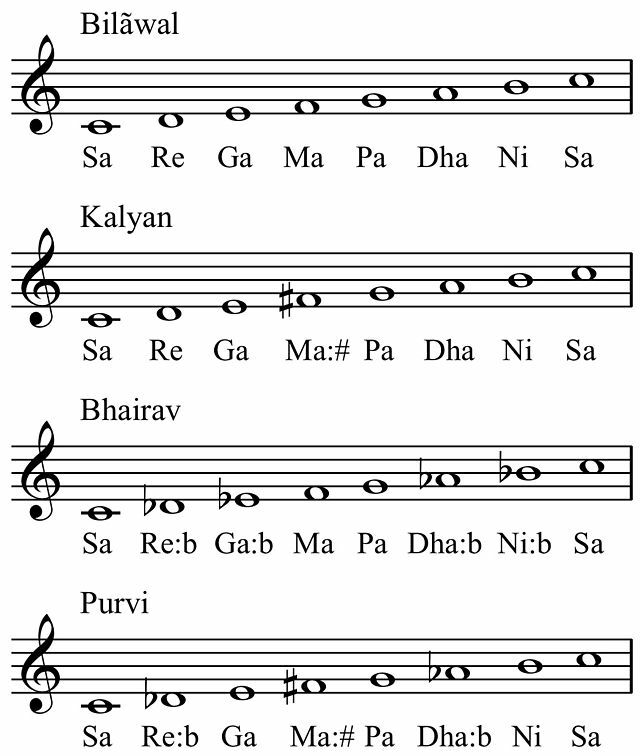 Each raag has these elements- aaroh (the ascending scale), avroh (aka the descending scale), pakad (the particular arrangement of music that allows for a raag’s identification) and they start out with an aalap i.e introduction. The introduction is usually played without any other accompaniments barring a tanpura drone. The aalap is followed by the playing the raag in different lays aka speed. With vilambit meaning slow and dhrut meaning a fast tempo. Bringing an end to a raag on a sitar is done by playing a jhaala that integrates a tihaai. Each raag can be played on different types of beats or taal (click to listen) in Hindustani classical lingo. Some of the most common taals are: Teen taal, Keherva, Rupak, Ektaal, Chautal, Dadra, Tilwada et al. This has been an attempt to encapsulate centuries of invaluable knowledge on music into a blog series. But the pursuit of music is a life long endeavor. I write pursuit because each time it feels like you’ve finally got your quarry in hand and begun to understand it, it suddenly shows a new dimension that has to be understood, learnt and mastered. Be as that may, a foray into music of any sort, especially one where the learning starts from the foundation up; is a step in the right direction of enrichment, self- discovery and liberation.